Rasam is a staple in South Indian cuisine, often served as the second course to rice. 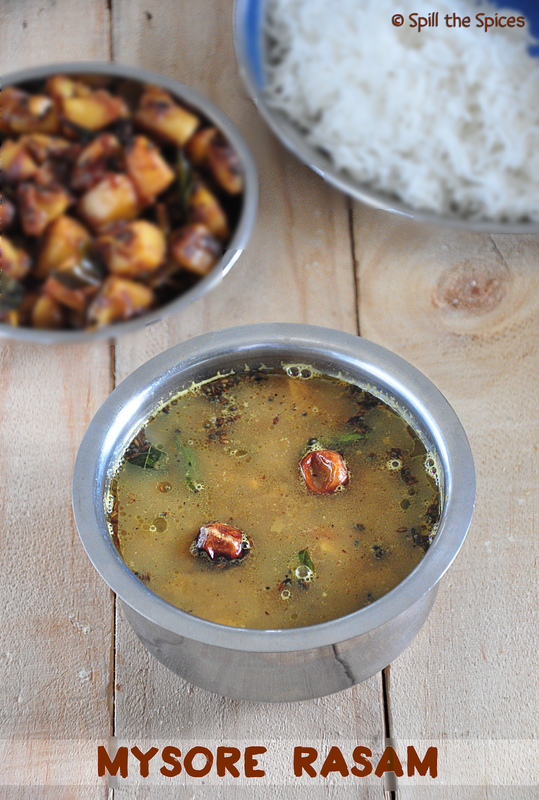 Nothing can beat the comfort of hot piping rasam, especially when paired with a potato fry! Today am sharing the recipe for mysore rasam, also called arachuvitta rasam, which is bit different from other rasam varieties. 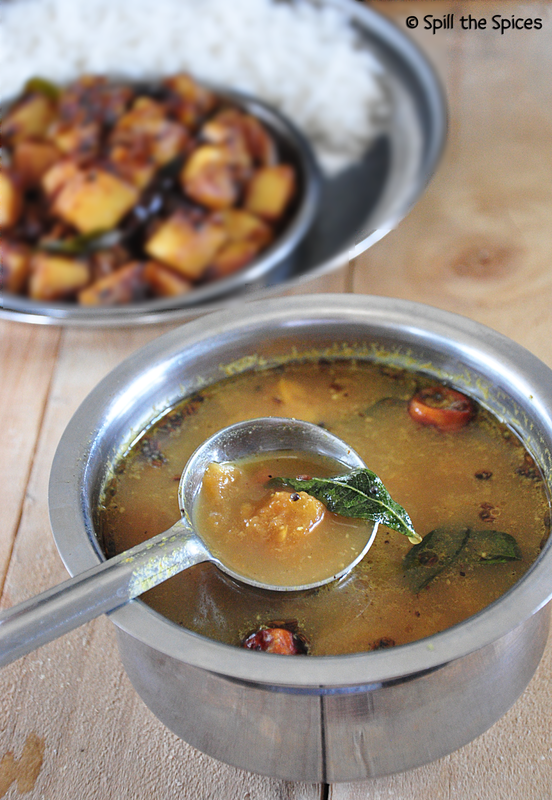 Mysore rasam has fresh coconut and jaggery. A freshly ground masala is made with coconut and other fresh spices which enhances the taste of the rasam. Any mezhukkupurati or no coconut-based vegetable stir-fry goes well this rasam, but the best combo for this rasam is potato fry. Let's see how to make this flavorful mysore rasam. 1. Wash and pressure cook the dal with 1 cup water and a pinch of turmeric powder. Mash well and set aside. 3. In a pan, add all ingredients except coconut and roast till dal turns golden. Add coconut and stir for a minute. Cool and grind to a smooth paste with little water. 3. Soak the tamarind in 2 cups of warm water and extract the tamarind juice. If using tamarind paste, dissolve in 2 cups warm water. 4. Add this tamarind water to a vessel, along with tomato, turmeric powder, asafoetida, few curry leaves, salt and 1 cup water. Bring to boil. 5. Once it comes boil, reduce the heat to low and let it simmer for 8-10 minutes or until the tomatoes have become soft. 6. Add the ground paste, jaggery and simmer again for 4-5 minutes. Then add the cooked dal and adjust the salt. 7. Simmer till the rasam starts to froth up. Remove from heat and add the coriander leaves. 8. In a small pan, heat ghee and add mustard seeds. When it splutters, add red chilly, jeera and curry leaves. Pour over the rasam. Cook the rasam in low heat, do not boil it. Add more water and adjust the consistency if the rasam is thick. 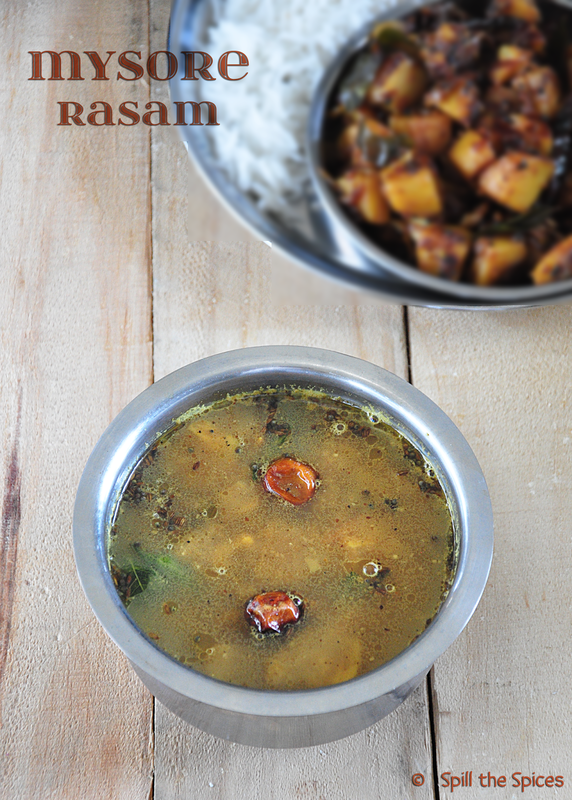 One of my favorite rasams, Rasam and the potato curry, delicious combo..
Tasty rasam! Looks very flavorful! Lovely platter, love rasam too. Delicious rasam..,,,, will try this ! Delicious rasam.. Loved the 2nd pic, super!!! How soothing!!! I never tried making rasam by myself, but this is the right time, I guess :D Super clicks, Sona! Love the tangy rasams.I make it often. Rasam looks very flavorful and delicious with the spices and coconut.. Nice clicks! Wat a comforting food, this rasam is in my to do list since a long, have to make soon..
rasam luks hot n spicy..nice. Mysore rasam looks delicious Sona Love it. love rasam and this one is very tempting.